Clay will play host to Portsmouth on Saturday to try and improve to 4-1 in the 2019 season. For the second consecutive night, the Minford Falcons (5-0, 2-0 in SOC II) shut down the Oak Hill Oaks 7-0 to earn their fifth win of the 2019 season in as many tries. To finish their season series, Minford outscored the Oaks 16-0 in their two games this season. Bailey Rowe threw a gem of a game for the Falcons on Thursday by going the distance and pitching all seven innings, allowing just four hits and striking out four Oaks batters. Rowe also drove in two runs on his lone hit of the game, a game high in Minford’s win. Elijah Vogelsong and Reid Shultz both finished 2/4 at the plate to cap off the Falcons fifth win of the young season. The Falcons will take the weekend off before facing conference rival Valley on Monday and Tuesday to try and earn two more conference wins in 2019. In their second home game of the season, the Wheelersburg Pirates picked up their second win in as many tries to improve to 2-1 (1-0 SOC II) in the 2019 season. Wheelersburg will face Northwest again on Friday with hopes of sweeping the seasons series against the Mohawks to improve to 3-1 while maintaining their unblemished SOC II record. The bat’s came alive for the Senators in their second win in as many tries this season. But it was the pitching performance from junior Cade McNeil that was the story of West’s (2-0, 1-0 in SOC II) second victory of the season. McNeil pitched a no hitter in the Senators 11 run win over Notre Dame finishing with 4.2 IP, giving up just a single earned run to go along with seven strikeouts. At the plate, it was another Cade, Cade Powell who delivered for the Senators by going 2/3 with four RBI in their second win of the season. Luke Howard also had another great batting performance by going 2/3 and also driving in four runs. West will try and improve to 3-0 on Friday when they will travel to South Webster to face the Jeeps. In a bounceback game for the Green, they were able to defeat South Webster 5-3 to pick up their second win of the season and improve to 2-1 (0-0 in SOC I). Bryce Ponn pitched a great game for the Bobcats, going the distance while picking up the win. Eli Webb went 2/4 at the plate with an RBI for Green qhile Mason Barber finished 1/3 at the plate with 2 RBI. Green improves to 2-1 before travelling to Chesapeake Saturday for a double header. 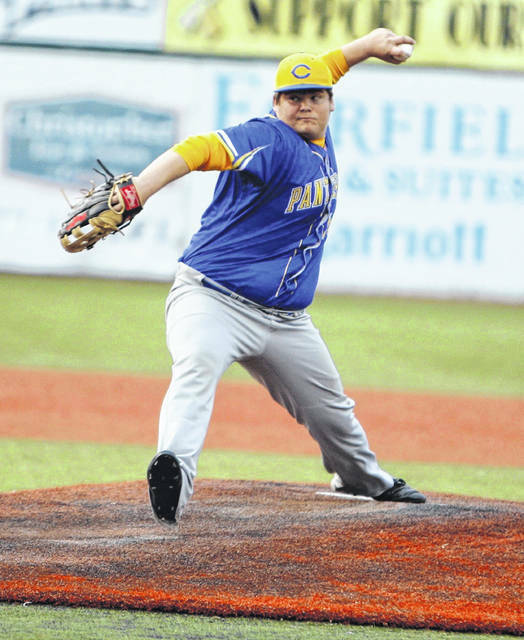 The Clay Panthers (3-1) dropped their first game of the 2019 season in a 9-2 decision vs. Paint Valley Thursday night at the VA in Chillicothe. Junior ace Dakota Dodds finished with 5.1 IP, six hits given up and just two earned runs given up. Dodds also finished with five strikeouts to just one walk Thursday. Clay Cottle and Jayden Jessie each finished with one hit, that hit being one of two Panthers runs on the night. Clay will host Portsmouth Saturday to try and pickup another win on the 2019 season. The Pirates (3-1) split a doubleheader Thursday night against two teams from West Virginia, falling in the first game and winning the second. In the first game, Wheelersburg suffered its first loss of the year in a four-run final. Mallory Bergan led the offense in that contest, going 1-for-2 with a double. In the circle, Sarah Claxon took the loss, throwing six innings, giving up five earned runs and striking out seven. In the second, a two-run victory, Christen Risner was 1-for-5 with a home run, Claxon was 2-for-4 with two doubles and two RBIs, Boo Sturgill was 2-for-3 with a double, three runs and an RBI, and Laney Eller was 3-for-4 with two runs. Sydney Spence got the pitching win, throwing seven innings and whiffing 11 batters. After scoring four runs in the bottom of the fifth, Ironton St. Joe sealed the deal on a 12-2 win over East (0-4) in non-conference action Thursday. East’s Hannah Ginn was 2-for-3 at the plate with a run while taking the loss on the mound in four innings of work. Ginn gave up 10 hits, eight earned runs an struck out five. The Jeeps (3-3) got a win over Green (1-3) Thursday in convincing fashion. South Webster was led by Baylee Cox, who was 2-for-5 with two doubles and four RBIs, while Rease Hall went 2-for-3 with two runs and four RBIs. Gwen Messer was also a factor, going 3-for-5 with a double, a run and two RBIs, and Bri Smith finished 2-for-4 with two RBIs. Charlie Blevins led Green’s offense, finishing 2-for-3 with a run. In the circle, South Webster’s Bri Claxon got the win, throwing three innings and whiffing six. The Senators (2-1, 2-0 SOC II) handed South Webster (2-4, 0-2 SOC II) a two-run loss Thursday in SOC II action. Leading West to a win was Abbie Pack, who was 1-for-3 with a double and two RBIs. Haivan Dillow was also a factor, finishing 2-for-3 with two runs, and Nataya Richards was 1-for-3 with two runs. In the circle, Kaleigh Parr earned the win, tossing all seven innings and allowing eight hits. The Trojans earned a run-rule win over New Boston (1-2) Thursday by a 14-0 final. Madison Perry led Portsmouth’s offense, going 4-for-4 with two doubles and two runs, Jacqueline Bautista was 3-for-3 with a home run, two doubles and four RBIs, and Cassie Potts had a good evening, going 2-for-2 with a double and two runs. In a non-conference road affair, the Titans (2-0) stayed perfect with a five-run win over Circleville. Taylor Schmidt led Notre Dame’s offense, going 3-for-4 with a run at the top of the lineup, Claire Dettwiller was 3-for-4 with two doubles and two runs, Cassie Schaefer was 1-for-3 with two RBIs, Isabel Cassidy was 2-for-3 with two runs, and Baylee Webb was 2-for-4 with an RBI. In the circle, Schaefer threw all seven innings, allowed 10 hits and struck out five. https://www.portsmouth-dailytimes.com/wp-content/uploads/sites/28/2019/03/web1_dakota-dodds.jpgClay will play host to Portsmouth on Saturday to try and improve to 4-1 in the 2019 season.